Eco-system ponds are The Pond Doctor’s specialty. We generally install Aquascape Systems with a skimmer and bio-falls. We use rocks and gravel in the pond to provide additional biological filtration and to hide the liner. Eco-system ponds are perfect for homeowners who enjoy having goldfish, plants, frogs, and birds living near by the pond. We provide a two-year no-leak warranty on any construction issues. Pumps and components also have a two year warranty. CLICK HERE to learn more and see examples of The Pond Doctor’s Northern Virginia eco-system pond designs and installations. Pondless waterfalls are becoming more and more popular. They require less maintenance then ponds and take up less space. They are also safe for small children. They still provide the soothing sounds and visual beauty of a waterfall. CLICK HERE to learn more and see examples of The Pond Doctor’s Northern Virginia pondless waterfall designs and installations. Disappearing fountains are perfect for small spaces. There are hundreds of vessels to choose from. Bubbling rocks, urns, and statues are just a few to choose. Townhouses are a perfect fit for a bubbling fountain. 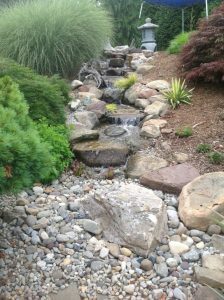 Call the Pond Doctor at (540) 272-6866 and we can help you find the perfect fountain for your landscape. 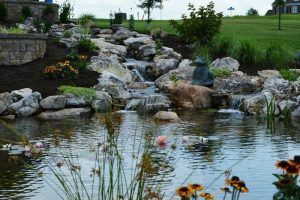 CLICK HERE to learn more and see examples of The Pond Doctor’s Northern Virginia fountain designs and installations.